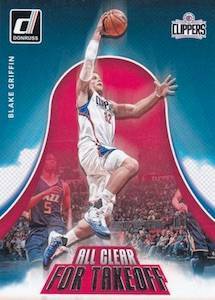 Although NBA card collecting has seemingly moved more to the high-end in recent years, 2017-18 Donruss Basketball is a perfect representation of an affordable brand with an established presence. And, the hits are still an option, with one autograph and one relic per hobby box. 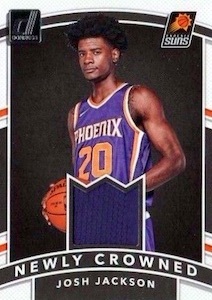 Headlining the 2017-18 Donruss Basketball checklist, the 50-card Rated Rookie subset naturally documents some of the best first-year players in the league. 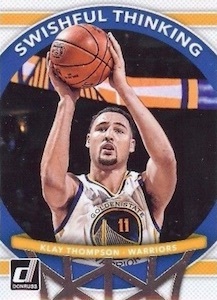 Collectors can also count on a selection of parallels with Press Proof Black and Press Proof Gold. More colorful parallels are found at the various retail outlets, with exclusives like Holo Orange Laser (Blaster), Holo Green Laser (#/99 - Retail), Press Proof Red (#/75 - Gravity), Holo Yellow Laser (#/25 - Retail), Press Proof Blue (#/25 - Gravity), Holo Purple Laser (#/15 - Blaster), and Holo Red and Blue Laser (#/15 - Fat Pack). 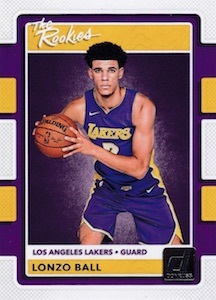 Averaging two per pack, 2017-18 Donruss NBA inserts include Swishful Thinking, which is obviously for the very best shooters, as well as All Clear for Takeoff, All-Stars, Court Kings, Hall Kings, Rookie Kings, Retro Series, The Champ is Here, and The Rookies. There are also many exclusive insert parallels across the retail formats. 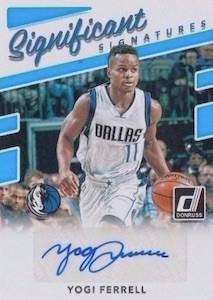 Despite being more of a budget-friendly release, 2017-18 Donruss Basketball does offer a decent amount of signed inserts and memorabilia cards. 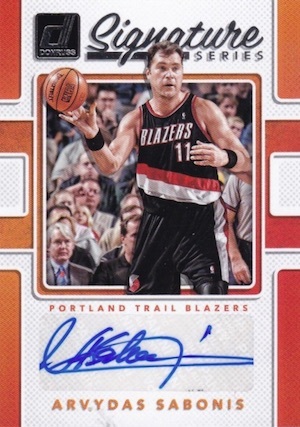 Perhaps most interesting, the Next Day Autographs set gets that name because the cards are printed and signed within 24 hours during the NBA Rookie Photo Shoot. Another constant for the brand, Dominator Signatures and Rookie Dominator Signatures both include Gold and Black parallels. In addition, the Rookie Materials Signatures (#/75) line maintains the primary look, but with a horizontal layout featuring an added relic piece and autograph. Prime versions are numbered to just 10 copies. 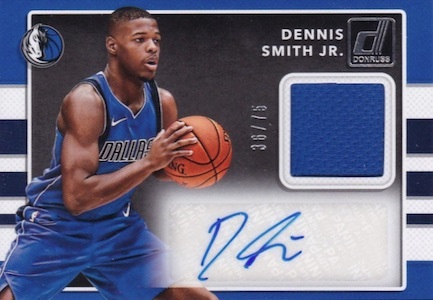 Collectors also have retail hits to chase in 2017-18 Donruss Basketball thanks to Jersey Series, Rookie Jerseys and Signature Series. PARALLEL CARDS: Green Flood, Press Proof, Press Proof Blue #/125, Press Proof Black 1/1. PARALLEL CARDS: Green Flood, Press Proof, Press Proof Blue #/125, Press Proof Orange #/99, Press Proof Black 1/1. 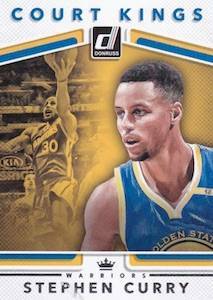 PARALLEL CARDS: Prime #/10 (Curry #/4*). 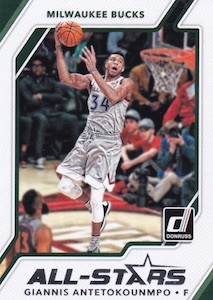 PARALLEL CARDS: Prime #/10 (No Drummond*). Another low end set with awful posed photos. Panini just doesn’t care about low end collecting. 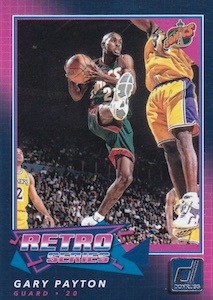 There was no effort put into this or the Hoops set. The photos all look the same and the autos are stickers. Ian a subset is part of the base set. Rated Rookies have been subsets since 1984. Panini does a horrible job of informing the consumer about their products. 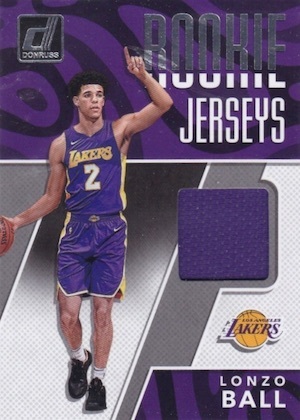 Are the rookies short printed? No checklist until the product is about to release! All the same photos are used from product to product. All the brick and mortar stores are allocated anywhere from 5 to 30% of the product they order. 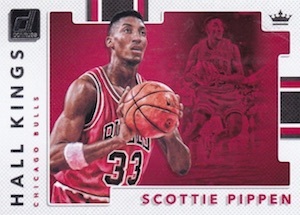 If Panini can’t produce enough product for the consumer, maybe they should lose their license. Having exclusive contracts with Target and Walmart are B.S. because that product rarely hits the store shelf. When the sub distributors A.K.A. 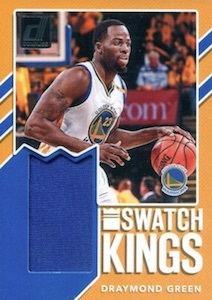 Dave and Adams, Blowout Cards end up with controlling % of the product, Something is wrong in the hobby. Maybe Panini should take a new look at their business model. 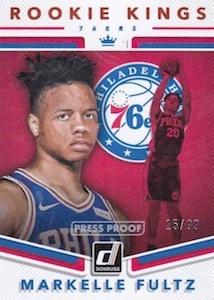 Panini is doing everything possible to ruin the hobby. And yes it’s a hobby. My Donruss box contained every card from 1-200 so all base and Rated rookies. 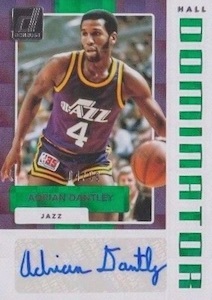 1 auto and 1 Mem, plus inserts and 4 numbered cards. So just like that, I don’t need to collect any missing cards. 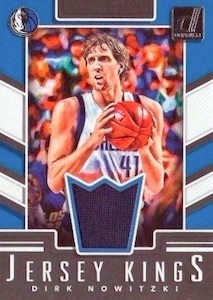 Great for the price conscious or new hobbyists but I’ll buy Prizm for the higher end hits. I like this product. It’s reasonably priced and, like one of the other people said, with one hobby box you can get most, if not all, of the base set including vets and rookies. 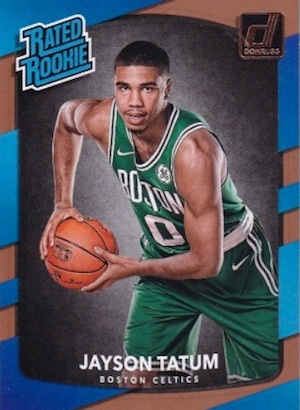 I think the poses for the Rated Rookies are so corny that they’re hilarious. The one-color relic and the sticker auto were not spectacular, but they were from accomplished players that I’ve actually heard of. For a lower-priced release, I was pleasantly surprised with this product. A solid effort. 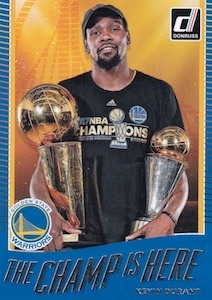 Basketball cards are the toughest to get really good photos. This set places the player in the center of the photo, which makes them prominent. Affordable and easy set to complete. While the border colors are different it does give way to a classical kind of card design. A solid effort.